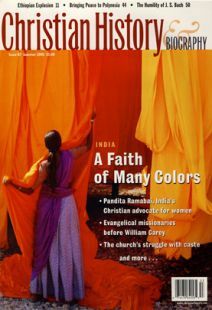 What was it about Sundar Singh that inspired many Indian and European Christians? Like Paul, he claimed that his conversion came through a vision of Christ and that he traveled to the “third heaven” in ecstasy. Like Francis, he imitated Christ’s life of poverty, wandering, and preaching. And like Christ himself, he taught in parables and suffered persecution. Yet in the Indian context that shaped Sundar Singh’s Christianity, all these aspects of exemplary Christian religious life had strong parallels in Indian traditions. The sadhu or “holy man” renounces worldly life in seeking ultimate “salvation.” In this way, Sundar Singh sought to demonstrate that Christian faith and Indian religious culture had much more in common than the Christianity brought by foreign missionaries seemed to allow. Indian Christians understood and appreciated this, and by the 1920s, many European Christians began to agree. Sundar Singh was 15 years old when he decided that the garden of the world, though filled with beautiful things, was not enough to satisfy him. In the absence of God, the garden itself lost its appeal. His growing spiritual longing, unsatisfied by his study of Hindu, Sikh, Muslim, and Christian scriptures, had left him no choice—either he would obtain the vision (darsan) of God or continue to search in the next life. As he prepared to commit suicide one night in December 1904, Sundar Singh received a vision of Christ, who revealed his crucified love to the young Sikh. This revelation brought him peace. It also provoked conflict. His father, a respected landholder in a rural village of Punjab, was not willing for the family to suffer the political and social humiliation of his son’s conversion to a “foreign” religion that predominantly attracted “untouchable” castes. As soon as Sundar Singh made his determination clear by cutting his hair (uncut hair was one of five symbols of Sikh identity), he was expelled from his home. His devout mother, before her death, had been a model of spirituality to her son and had instilled in him the desire to emulate the mendicant ascetics (sadhus) whom she venerated. His vision of Christ and his expulsion from home provided the opportunity to pursue this path. After he was baptized, he gave away his few possessions and began to wander, accepting offerings of food as he went from village to village, meditating on, preaching, and singing the news of God’s incarnation (avatara) in Christ. Though the largely Presbyterian missionary community of Punjab had long been opposed to this kind of “syncretism,” the blending of asceticism with devotion to Christ made sense to Sundar Singh. If the world was like a garden in which God was hidden, it was best not to be distracted by worldly pleasures, however good and sweet. In long hours of meditation, prayer and fasting, he found the vivid presence of Christ much sweeter than any other experience. Sundar Singh was not the first convert to combine Indian asceticism and Christian devotion, or to have visions. His fame in the 1920s might never have extended beyond the villages of North India. After his first decade of wandering (ca. 1905—1915), he remained nearly as obscure as Christian sadhus who had preceded him. But times were changing. Some liberal missionaries were embracing “fulfillment theory.” Proponents of this view, as expressed in J. N. Farquhar’s The Crown of Hinduism (1913), argued that non-Christian religions were a praeparatio evangelica and hailed Sundar Singh as a living example of the fulfillment of Hinduism in Christ. Consequently, as English-language publications about him were produced, he was invited on a series of wide-ranging tours, both in India and abroad. The Christian West was in need, not only of a new “St. Paul,” but also of a hero similar to self-consciously “Hindu” mahatmas or “saints” such as Gandhi. Once invited abroad, however, Sundar Singh’s message was disarmingly simple. It focused not on theological assessments of “other” religions, missionary strategy, or Indian nationalism, but on the universal human need to seek God, and on God’s revelation in Christ. The one thing necessary for those in both East and West was to sit in silence at the feet of the Divine Master, who was equally hidden and equally accessible to all. Timothy Dobe is a doctoral student at Princeton Theological Seminary.